◊ The introductory 3.99% interest rate applies only to cash advances (including balance transfers, Scotia® Credit Card Cheques and cash-like transactions) (collectively "Cash Advances") subject to the conditions below (the "Offer"). This rate applies when the new Scotiabank credit card account ("Account") is opened by June 30, 2019 and will continue for 6 months from date of Account opening (the "Promotional Period"). This Offer cannot be used to transfer a balance from another Scotiabank Account, or to make a payment or deposit to another Scotiabank Account. After the Promotional Period, the 3.99% interest rate on any promotional balance transfers (including any that remain unpaid after the Promotional Period ends) will increase to the preferred interest rate on Cash Advances (currently 16.99%). If you don't pay the minimum payment on your Account by the payment due date on your statement, two times in any consecutive 12-month period, you will lose the benefit of this promotional rate Offer and the interest rates that apply on any unpaid balance will increase to the standard annual interest rates that apply to your Account (currently 24.99% on purchases and 27.99% on Cash Advances). In general, if you make a payment that exceeds the minimum payment on your statement, we will apply your payment on a proportionate basis among each group of billed charges on your Account. We group charges based on the interest rate that applies to the group of charges. Your payment cannot be applied to the balance(s) of your choice. See your credit card agreement for more information about how we apply payments to your Account. 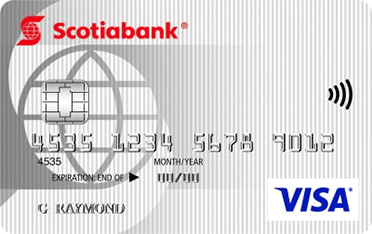 As far as low balance transfer cards go, the No-Fee Scotiabank Value® VISA card is a pretty decent option, though not as strong as the fee version (Scotiabank Value® VISA Card). The card comes with a 3.99% introductory interest rate on balance transfers and cash advances for the first six months (16.99% thereafter) and an ongoing purchase rate of 16.99% - which is lower than many other cards on the market. This card is a good solution for those who are looking to pay off a credit card balance quickly (ideally within the 6-month introductory rate timeframe) and who do not wish to pay an annual fee.